Our website will undergo scheduled maintenance on the day of Friday, April 26th. During this time, connection to our website and some of its features may be unavailable. Thank you for your patience and we apologize for any inconvenience. Darker-colored states have a higher dollar level change in median adjusted gross income, and lighter-colored states have a lower change. Darker-colored counties have a higher unemployment rate, and lighter-colored counties have a lower unemployment rate. Green-colored nations have a positive net migration, orange-colored nations have a negative net migration, and yellow-colored nations have essentially zero net migration. Darker-colored counties have a higher percent of their population with at least a bachelor's degree, and lighter-colored counties have a lower percent of the population with at least a bachelor's degree. Darker-colored counties have a higher percent of their population with at least high school diploma, and lighter-colored counties have a lower percent of their population with at least high school diploma. Darker-colored counties have a higher per capita personal income, and lighter-colored counties have a lower per capita personal income. Darker-colored counties have a higher personal average income, and lighter-colored counties have a lower average personal income. Orange-colored counties have an increasing number of SNAP recipients, and blue-colored counties have a decreasing number of SNAP recipients. Darker-colored counties have a larger civilian labor force, and lighter-colored counties have a smaller civilian labor force. Darker-colored counties have larger increases in resident population, and lighter-colored counties have a lower increases or decreases in resident population. Darker-colored states have a greater increase in total nonfarm employees relative to lighter-colored states, which have less of an increase or decrease in total nonfarm employees. Darker-colored states have had a greater increase in total private employees relative to lighter-colored states, which have less of an increase or decrease in total private employees. Darker-colored states have a higher percent change in the coincident economic activity index, and lighter-colored states have a smaller change in coincident economic activity index. Darker-colored states have a greater increase in the leading index, and lighter-colored states have a lower increase in the leading index. Orange-colored states have a negative monthly change in building permits for one-unit structures, and blue-colored have a positive monthly change. Orange-colored states have a negative monthly change in building permits, and blue-colored have a positive monthly change. Green-colored states have a positive change in real median household income, and light green-colored states have a negative change. Green-colored states have a positive change in median household income, and light green-colored states have a negative change. Darker-colored states have a higher real total gross domestic product per capita, and lighter-colored states have a lower real total gross domestic product per capita. Darker-colored states have a higher real total gross domestic product per capita, and lighter-colored states have a lower total gross domestic product per capita. Darker-colored states have a higher per capita personal income, and lighter-colored states have a lower per capita personal income. Darker-colored counties have a higher percent of their population 25 years and over with at least a bachelor's degree, and lighter-colored counties have a lower percent of the population 25 years and over with at least a bachelor's degree. Darker-colored counties have a higher percent of their population 25 years and over who have an advanced degree, and lighter-colored counties have a lower percent of the population 25 years and over who have an advanced degree. Darker-colored counties have a higher percent of their population 25 years and over who have at least have a high school diploma, and lighter-colored counties have a lower percent of the population 25 years and over who have at least a high school diploma. Darker-colored states have a greater increase in resident population, and lighter-colored states have a lower increase or decrease. 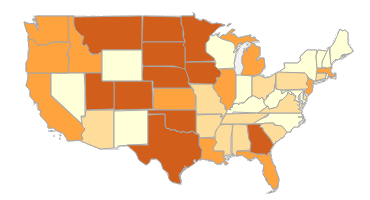 Darker-colored states have a higher rental vacancy rates, and lighter-colored states have a lower rates. Darker-colored states have a higher home vacancy rates, and lighter-colored states have a lower rates. Darker-colored states have a higher homeownership rates, and lighter-colored states have a lower rates. Darker-colored states have relatively more commercial banks, and lighter-colored states have relatively fewer. Darker-colored nations have relatively higher GDP per capita, and lighter-colored nations have a lower GDP per capita. Darker-colored nations have a higher fertility rate, and lighter-colored nations have a lower rate. Darker-colored nations have a higher infant morality rate, and lighter-colored nations have a lower rate. Darker-colored nations have a higher rate of internet users, and lighter-colored nations have a lower rate. Darker-colored nations have a higher life expectancy, and lighter-colored nations have a life expectancy. Darker-colored nations have a higher percent of their population between the ages of 0 and 14, while lighter-colored nations have a lower percent of their population in that age range. Darker-colored nations have a higher percent of their population between the ages of 15 and 64, while lighter-colored nations have a lower percent of their population in that age range. Darker-colored nations have a higher percent of their population at or above 65 years of age, and lighter-colored nations have a lower percent of their population in that age range. Darker-colored nations have larger populations, and lighter-colored nations have smaller population. Darker-colored nations have a higher real broad effective exchange rate index value, and lighter-colored nations have a lower index value. Darker-colored nations have lower price changes in the harmonized index of consumer prices for the overall index, and lighter colored nations have higher price changes. Darker-colored nations have a higher inflation rate in the harmonized index of consumer prices for the overall index excluding energy, and lighter-colored nations have a lower rate. Darker-colored nations have higher rates on increase in their harmonized index of consumer prices for energy, and lighter-colored nations have lower rates. Darker-colored nations have a lower inflation rate in the harmonized index of consumer prices for services excluding goods, and lighter-colored nations have a higher inflation rate. Darker-colored nations have higher inflation in prices for the education, health, and social protection index, and lighter-colored nations have lower inflation rates. Darker-colored nations have a higher harmonized index of consumer prices for goods excluding services, and lighter-nations have a lower index value. Darker-colored nations have a higher compounded annual rate of change in the harmonized index of consumer prices for alcoholic beverages, tobacco, and narcotics, and lighter-colored nations have a lower rate. Darker-colored nations have a higher compounded annual rate of change in the harmonized index of consumer prices for beer, and lighter-colored have a lower rate. Darker-colored nations have a higher compounded annual rate of change in the harmonized index of consumer prices for clothing and footwear, and lighter-colored nations have a lower rate.